The Urban Infrastructure work—Project Eleven – a private development in Bratislava Koliba, required the construction of retaining walls under their new residential development project for houses with a view of Bratislava. Maccaferri’s technical team collaborated with the investor / developer of the project and their team of designers to design, manufacture and supply high quality durable materials which enhance the service life of the works, reduce environmental impact and provide client reassurance. 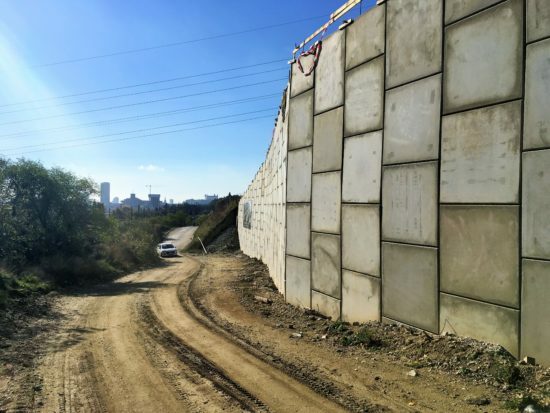 The outcome of the joint effort was the decision to build vertical concrete faced soil reinforcement structures made from Maccaferri’s MacRes system. Facing panels are made from 140 mm thick precast concrete which are anchored to the embankment backfill by ParaWeb high adherance geostrips. The ParaWeb geostrips are placed within the layers of structural backfill which is compacted upon them. The resulting reinforced soil block retains the ground beyond it. The wall has a 90° slope face and an in-situ reinforced concrete capping is placed on the top of the wall. Fascia concrete panels are made from concrete C30/37-XC4, XD1, XF2 (SK) and in accordance with static calculations they are reinforced with steel. Before the construction started, engineers from MACCAFERRI CENTRAL EUROPE organized training for site workers, in order to ensure correct installation of the system on-site. Maccaferri engineers also monitored the placing of the first layer of the panels — especially the right positioning of panels — to the desired angle. Based on this service and the installation manuals supplied to the contractor, construction continued without any problems. Construction of the wall is now finished. The next step is to lay the prefabricated panels on the top.